This big white window is right next to the exit of Indian Coffee House cafeteria at Jawahar Kala Kendra, Jaipur. While I was heading out I spotted this and the shadow of the trees falling on it caught my attention. I immediately realized that I had a great opportunity for creating a Minimalist Frame. Initially, I tried composing from the front but that was too mundane. Therefore, I moved to the side and turned my camera vertical. I kept moving until I could find something worthwhile to add to the frame. 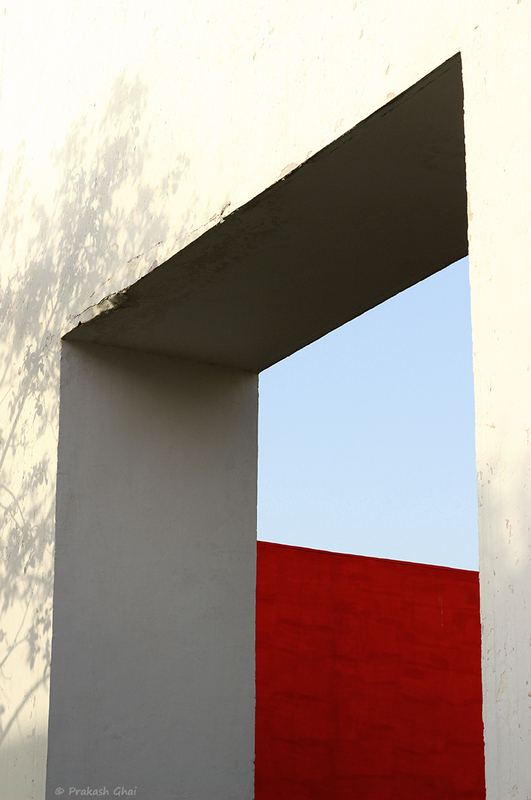 As soon as I found the red wall "Engulfed by the Blue Sky", I stopped, composed and then recomposed. Finally after some 4-5 shots, I got the frame the way I wanted.